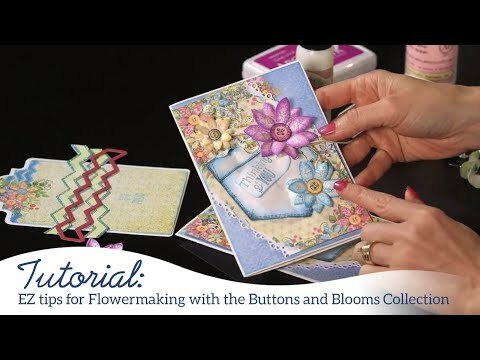 For more tips on creating with the tags & sentiments, watch the tutorial at https://youtu.be/eAfLuNkRda4. Instructions: For card base, cut a piece of white card stock 6" x 12", fold in half. Cut a piece of navy card stock 5 7/8" square, adhere to card front. Cut a piece of yellow design paper 5 3/4" square, add to card. Cut a piece of patchwork design paper 5 5/8" square, add to card. Stamp pocket on pink design paper from the Sweet Peony Paper Collection with VersaMark and emboss with Snow. Cut with coordinating die and add to right upper corner of card. Stamp hexagons on pink Sweet Peony Paper with Magenta Hue, and on blue card stock with Faded Jeans. Cut with coordinating die. Stamp medium and small flowers on yellow card stock with Pale Ochre and cut with coordinating die. Stamp buttons on white card stock with Magenta Hue, cut with coordinating die and add glossy accents. 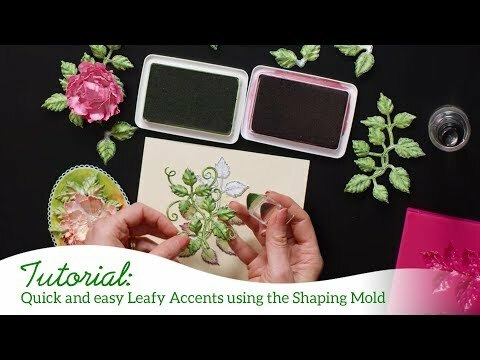 Stamp leaves on white card stock with Bamboo Leaves and sponge with the same and Magenta Hue with the sponge daubers. Cut with coordinating die. Stamp sentiment with Midnight Blue and cut with Small Ornamental Tag die. Cut the 4.25" eyelet circle from navy card stock. Cut the 3.5" circle from white card stock and craft foam. Add 7 hexagons to the white circle. Adhere the craft foam circle to the white circle and then adhere to the navy circle. Add this piece to the card front. Cut the leaves apart and add some to the flower and some under the Ornamental Tag. Adhere the flower to the center of the hexagons. Die cut the larger Ornamental Tag from navy card stock and craft foam and then adhere the craft foam to the back of the navy piece. Adhere the sentiment piece to the navy and then add to the card. Add the seam binding bow.